This shirt slightly accentuates the body, but is not cut to be tight-fitting. If you prefer to wear your shirts tight, we recommend to choose a smaller size. New exclusive limited collection! 'I will shop till I drop' T-shirt by OKE by me. Love to shop?? Don't be ashamed, show it!! 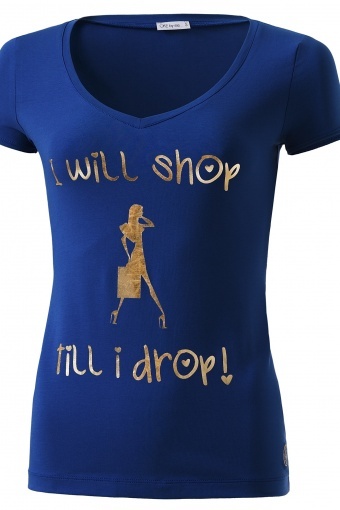 Very fashionable t-shirt with I will shop till I drop-print in shiny gold tone. This t-shirt is a real fashion-catch and can be worn in lots of ways. The V-neck and cute capsleeves are utterly flattering and the shirt accentuates your body very subtle. The shiny gold toned print contrasts really nice with the rich blue colour of the shirt. The embroidered logo in spun gold leaves a luxurious finishing touch. Who doesn't want to steal the show with this fabulous eyecatcher ;-) ? All OKE by me-shirts are made of Egyptian cotton, which is famous for its durability and super soft feeling, and are produced fairly in Portugal.